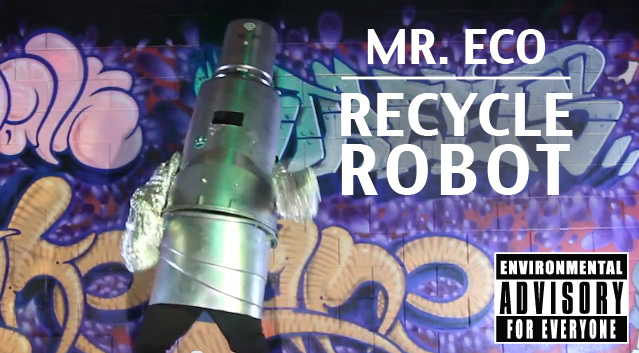 Environmental rap superhero Mr. Eco has just released his new song and music video “Recycle Robot”, a fun new short geared towards educating kids on recycling. “When we don’t recycle it starts a downward spiral, it’s about time that this goes viral,” says Mr. Eco, aka Brett Edwards of California. Edward’s goal is to empower the nation’s youth to become ‘EcoHeroes’ by living sustainably and following the messages in his songs. Check out the video above or download the song for you kids over at his site! Environmental rap superhero Mr. Eco has just released his new song and music video “Recycle Robot”, a fun new short geared towards educating kids on recycling. “When we don’t recycle it starts a downward spiral, it’s about time that this goes viral,” says Mr. Eco, aka Brett Edwards of California. Edward's goal is to empower the nation's youth to become ‘EcoHeroes’ by living sustainably and following the messages in his songs. Check out the video above or download the song for you kids over at his site!